The Tequila Sunrise is a cocktail made in two different ways, the original (tequila, crème de cassis, lime juice and soda water) and the more popular concoction (tequila, orange juice, and grenadine syrup). Originally served at the Arizona Biltmore Hotel, the cocktail is named for the way it looks after it has been poured into a glass. The denser ingredients (cassis or grenadine) settle, creating gradations in color that mimic a sunrise. 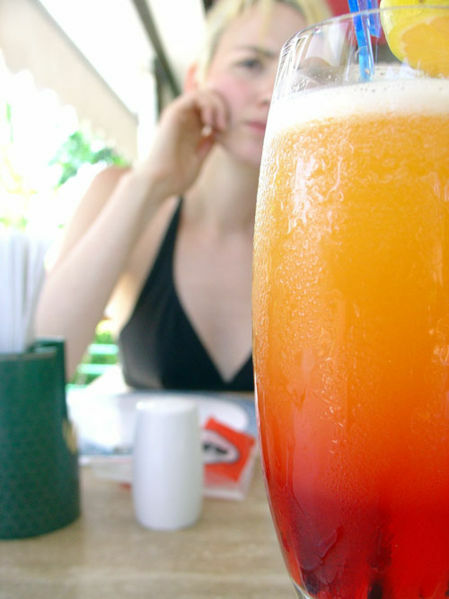 The Tequila Sunrise is considered a long drink and is usually served in a highball glass. Serve in a highball glass, on the rocks; poured over ice, garnished with orange slice and cherry.